October 26 – Saudi Pro League – Mohamed Awad featured in Al Wehda’s 3-1 victory against Ohod in the seventh fixture of the Saudi Pro League. following the win, Awad’s side currently occupy the fourth league spot with 15 points ahead of the encounter against Al Shabab on the 1st of November. October 26 – English Championship – Aston Villa lost 1-0 to QPR in the Championship as Elmohamady featured for 63 minutes. In the first half, Aston Villa were dominant but they couldn’t capitalize on the chances. Towards the end of the first half, Pawel Wszolek opened the scoring for QPR. In the 63rd minute, Elmohamady was replaced by Bolasie but the Villians couldn’t score the equaliser. October 27 – Turkish Super League – Kasimpasa came from behind to draw 1-1 with Buyuksehir Belediye Erzurumspor thanks to a Diagne penalty. Kasimpasa were dealt a blow just before halftime when Mor made it 1-0 to the home side, however they showed great spirit in the second half against the 10 men of Erzurumspor as Diagne scored from the spot to level up the game. The result puts Kasimpasa level on points with league leaders Galatasaray although the reigning champions have a game in hand to pull clear. 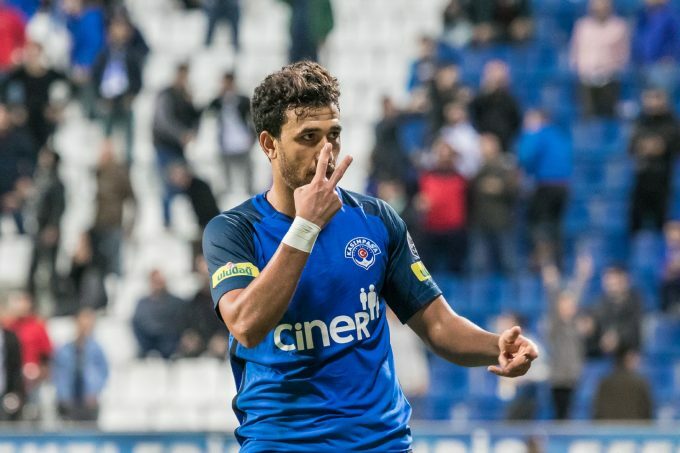 Kasimpasa’s next game is in the Turkish Cup against Batman Petrolspor on Tuesday. October 27 – Championship – Morsy started as Wigan lost a six-goal thriller away at promotion hopefuls Sheffield United. United broke the deadlock through a Dunkley own goal but it was cancelled out by Naismith’s equaliser. Billy Sharp got his first of what would prove to be a fruitful day just before halftime, before adding his second and third goals just after the break. Garner got a consolation goal in the 69th minute but the game ended up finishing 4-2 to Sheffield United. Wigan are now 15th in the table and have another tough game coming up at home against Bielsa’s Leeds next Sunday. October 27 – Turkish Super League – Istanbul Basaksehir won 1-0 against Konyaspor as Karim Hafez watched from the bench. Basaksehir dominated the first half but they couldn’t capitalize on any of their chances. In the beginning of the second half, Riad Bajic made it 1-0 to Basaksehir after being played in by Kerim Frei. Karim Hafez’s Basaksehir are currently top of the league pending Galatasaray’s match. Their next match will be against Besiktas on 3/11. October 27 – English Premier League – Huddersfield lost 3-0 against Watford as Ramadan Sobhi made his second appearance for The Terriers. Watford took an early lead as Pereyra slotted the ball home after dribbling past three players. Minutes later, Deulofeu made it 2-0 after a great shot into the far corner. Huddersfield almost halved the deficit but Foster parried Lowe’s shot onto the post. Ramadan Sobhi made his come back from injury in the 63rd minute replacing Mbenza. In the closing minutes, Success scored the third goal for Watford to secure the three points. Huddersfield are currently the bottom of the league with three points from 10 matches. Their next match will be against Fulham on November 5. October 27 – Championship – Ahmed Hegazi was excluded from the Hawthorns squad for a hamstring injury in their 1-1 meeting with Blackburn Rovers in matchday 15 of the English championship. West Bromwich now stand fifth on the table, their next encounter will be away against Hull City on the 3rd of November. October 27 – Greek Super League – Zamalek loanee Bassem Morsi was excluded from the squad as AE Larissa played out a 0-0 draw with OFI Crete at home. Following the result, Bassem Morsi’s side sit 11th in the league table ahead of their next game against Irodotos in the Greek Cup. October 29 – Greek Super League – Warda came off the bench as PAOK beat Panathinaikos 2-0 with a second-half goal flurry. Following a goalless first half, Prijovic broke the deadlock in the 51st minute and they held onto the lead before doubling it 15 minutes from time through Limnios. The result puts PAOK top of the league with a 100% record so far, with their next test against fellow high flyers Atromitos. October 31 – UAE Pro-League – Marcus Berg’s goal was not enough as El-Shahat’s Al Ain lost at home to Al Sharjah. Wellington broke the deadlock midway through the first half and it was followed up by a Coronado penalty in the second half to make it 2-0. Berg pulled one back but it was not enough to salvage any points as Sharjah held on for a 2-1 win. The result puts Sharjah four points clear at the top of the table, with Al Ain’s next game at home against Baniyas on Sunday the 4th of November. November 1 – Saudi Pro League – Mohamed Awad played the full 90 minutes, as Al Wehda lost 1-0 against Al Shabab in the eighth fixture of the Saudi Premier League, thanks to Hatan Bahbir’s early second-half goal. Following the loss, Awad’s side sit fourth with 15 points ahead of their encounter against Al Hilal on the 11th of November. November 1 – Greek Cup – Mahmoud Shikabala missed out his side’s 5-0 victory over Apollon Paralimniou in the Greek Cup. They currently sit second in Group F with three points ahead of their final game against Trikala on December 5. However, their next game will be against OFI Crete in matchday nine of the Super League.